Alamo Nursing Home strives to employ compassionate, knowledgeable, and caring individuals who will care for our residents as though they are their own family. Alamo Nursing home is one big family from residents to staff. Currently, Alamo employs well over 140 individuals from the greater Kalamazoo area. Positions at the Nursing Home are in the following departments/categories: Office/Administration; Social Work; Nursing; Rehabilitation; Activities; Dietary; Maintenance; Laundry; and Housekeeping. While specific positions we are looking to fill may be posted on this page, we are always accepting applications. Please feel free to download and fill out our application. Applications may be emailed, faxed, mailed, or dropped off in person. Alamo Nursing Home, Inc. is an equal opportunity employer. All positions may be applied for in person Monday - Friday 8am - 4pm. Positions may also be applied for with the above application through fax, email, or regular mail. Alamo is currently looking for motivated individuals to work in our dietary/kitchen department. We are looking for a Cook part-time, with the potential for more hours, and a full time dietary aide. Alamo is currently looking for motivated individuals to work in our housekeeping department full time. The positions available are afternoon shifts (12p-8p). Alamo is currently seeking an individual to work as part of our laundry team full time. This position would have hours every other weekend, 6a-2p. This is a part time position. LPN'S AND RN'S: Alamo is currently seeking nurses for afternoon shift (2PM-10PM) and night shift (10pm-6am), full-time and part time. This position does require work on a computer, so familiarity with basic computer functions is required. Individuals must also hold a valid RN or LPN license in the State of Michigan in good standing. CNA's for 2nd shift (2p-10p) full and part time. CNA's 1st shift (6a-2p) part time (Weekends). 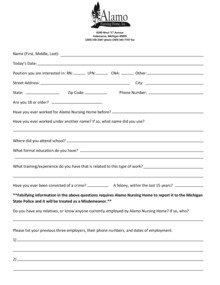 Individuals must hold a valid CNA certification in good standing in the State of Michigan, or have recently completed an accredited certification program.